We love this original design from Jennifer Zeuner, the perfect way to show your love for someone or remind yourself that you're loved every day! The letter 'l' measures approximately 2 inches and is accompanied by 'o' 'v' and 'e' charms which measure a inch, hanging from a subtly adjustable chain which you can wear at 16", 18" or 20". 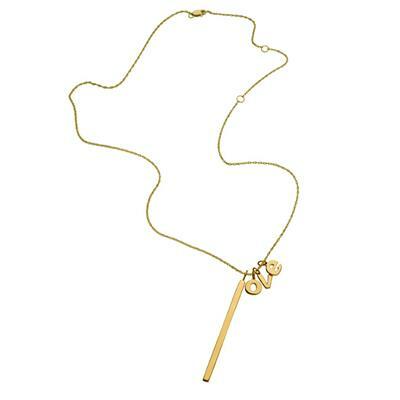 Made from 14k Gold vermeil, this fabulous design is also available in Silver. Choose from Sterling Silver or 14k Gold vermeil, Jennifer Zeuner's collection is inspired by her own personal style: simple, with a spiritual twist. This fabulous collection has a stellar following, with celebrity fans including Cameron Diaz, Sarah Jessica Parker, Beyonce and Taylor Swift. This cute Pure Attraction Bracelet is the perfect addition to your bracelet stack! Add a little love to your collection with this Silver stretch ball bracelet.